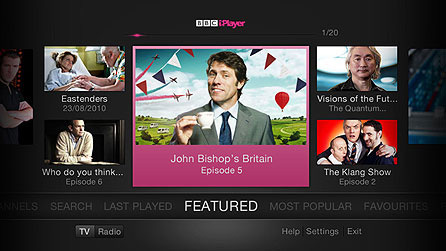 The BBC is launching a newly designed version of its iPlayer service which has been tailored for use on televisions. Initially accessible through the Sony Playstation 3, the new version is to be rolled out across set-top boxes and internet-capable televisions. Simplified for television the new version can be accessed with a TV remote and personalised for ‘favourites’ and playback. Daniel Danker, BBC general manager of programmes and on demand says, ‘We’re transforming iPlayer in its most natural home: right on the living-room TV. ‘By creating a product that’s as simple and intuitive as flicking through TV channels, the BBC is bringing on-demand television to mainstream audiences across the UK,’ he adds. The BBC says that with ten per cent of all TVs sold in the UK market in 2010 internet-ready, it sees a high potential for take-up. This latest version of iPlayer follows a new global iPlayer iPad app, launched two weeks ago as ‘a new global brand and concept,’ which has been designed to help international audiences ‘discover new content’, according to head of design and user experience for bbc.com and global iPlayer Duncan Swain. Swain appointed Pinch Zoom in October 2010 to help BBC Worldwide design the global iPlayer ‘pilot product’.